Are you looking forward to the sports event recorded by TiVo for unprecedented viewing experience in the living room after work? It's true! Thanks to the Apple TV and Samsung TV, you can. Just build a home entertainment system and get Samsung Television set work on Apple TV, as long as it has hdmi input and supports 720p or 1080p resolution! Then is it possible to put Tivo recordings on Samsung TV from Apple TV? Does Sumsung TV support Tivo shows via ATV? While, here I offer a simple workaround to transcode TiVo recordings to Samsung TV preferred .mp4 format for playing through Apple TV. From what I have seen on the TIVO blogs, neither Samsung TV nor Apple TV is not compatible with Tivo files since all TiVo files are DRM protected. Presumably you have more than one HDMI port on your Samsung TV, and what is happening is that the TIVO is switching the TV to itself. There is probably a setting in the Samsung TV for disabling HDMI Control which should put a stop to this. The set should switch back to the ATV when the TIVO is in standby but with the ATV being on all the time this causes problems with auto switching. This is why Samsung TV can't recognize TiVo from Apple TV directly. Don't worry. 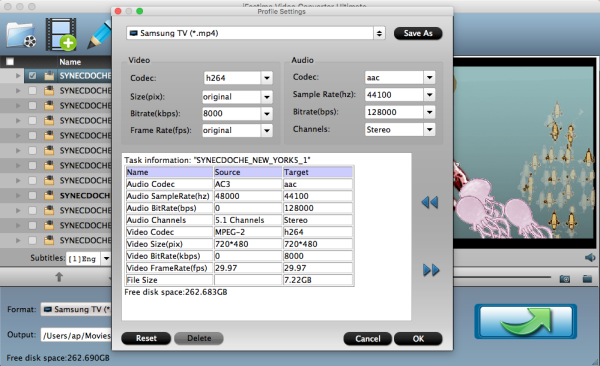 Let's try some easier and quicker way here: transcode TiVo to Samsung TV/ATV supported file format. 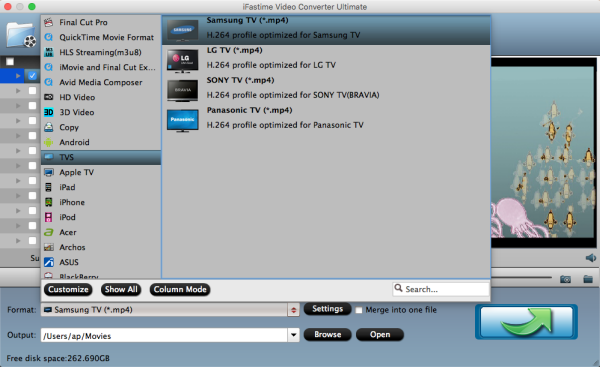 After fetching TiVo recovered shows and transfers them to your Mac, you can take the aid of a safe and versatile movie/video converter tool- iFastime Video Converter Ultimate for Mac, to help you easily remove DRM from Tivo recordings or Tivo shows automatically and convert TiVo shows to Samsung TV/Apple TV supported video keeping original quality as it provides the optimal presets for Samsung TV, Apple TV 3, Apple TV 2 and Apple TV. Besides, you are allowed to edit the videos by trimming, cropping, adjust video effects, etc to get the wanted part and effects as you like. More than TiVo files, it can also support encoding MKV, WMV, AVI, FLV, MPG, VOB to Samsung TV to meet your different needs. 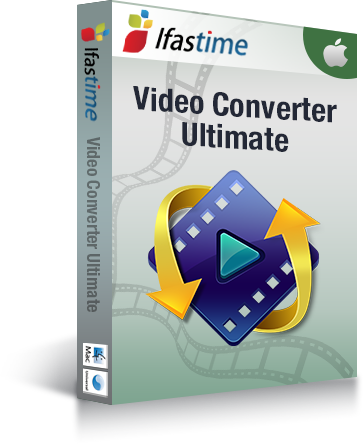 For Windows users, please get iFastime Video Converter Ultimate. Learn how to do Tivo conversion for Samsung TV and Apple TV on Mac with only four steps that save you a much time and effort. Note: If you record a show on your TiVo box and want to transfer them to your Mac-based computer, you can follow the instructions to transfer TiVo shows to your Mac OS X. Launch the Mac TiVo file converter, then head to the folder where the TiVo files are stored and then add the files to the program. 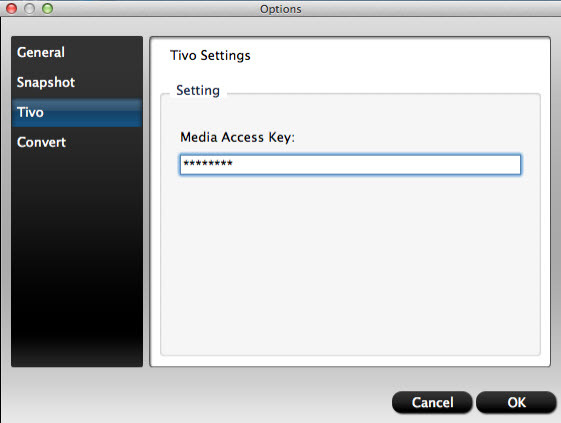 Tip: When first loading, this TiVo Converter will ask you to input your Media Access Key. Simply enter your Media Access Key, and click "OK" to confirm. Click on the dropdown menu of "Format" and then move your pointer to "TVS > Samsung TV (*.mp4)" which is the compatible format for Samsung TV and can also be recognized by Apple TV. Then you can set the output folder by clicking "Browse" icon as you need. The TiVo recordings may needs a little trimming for viewing on Samsung TV. The recorded TV shows and movies tend to have commercials, so you can use the converter's Trim feature to get rid of these. Click "Start conversion" button to start converting TiVo to Samsung TV/ATV format. After the conversion, get the output files by clicking the Open button. Now you will now have no trouble to stream TiVo to Samsung TV through Apple TV using AirPlay. 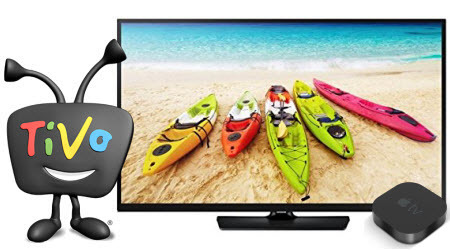 Enjoy your sports event recorded by TiVo on Samsung TV! 1. You can click "Settings" button to custom video and audio setting like resolution, bit rate, frame rate, sample rate, audio channels, etc. 2. By ticking off "Merge into one file" option, you are able to join the imported TiVo clips into a single file. 3. It's okay to stream and play converted Tivo to Samsung TV via other media streamers if you have a streaming device like Chromecast, Roku, Xbox or PS3. 4. Let's get you familiar with your TiVo Mini, so you can watch live TV, recorded shows and web entertainment on another TV in your house. This easy-to-follow guide gives you simple instructions to set up your TiVo Mini and share the TiVo experience in another room. 5. Why choose Tivo? TV programming is often inconsistent with the time we expect, with Tivo digital video recorder, we can play the recorded videos when you have the enough time and enjoy them. So convinient, isn't it?